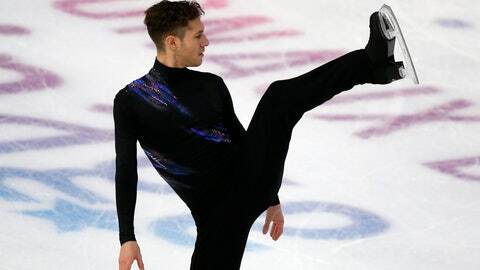 GRENOBLE, France (AP) — Without attempting a quad jump, Jason Brown built a solid lead at the French round of the Grand Prix figure skating series on Friday. In the women’s short program, less than half a point separated the top three, led by Mai Mihara. The 19-year-old from Japan scored 67.95, a whisker ahead of 16-year-old compatriot Rika Kihira. In the pairs, Aleksandra Boikova and Dmitrii Kozlovskii lead going into the free skate. The Russians scored 68.83 in the short program. North Koreans Tae Ok Ryom and Ju Sik Kim scored 67.18 for second place, and French pair Vanessa James and Morgan Cipres was third on 65.24. In ice dance, the French pairing of Gabriella Papadakis and Guillaume Cizeron outclassed the field in the rhythm dance. The three-time world champions and Olympic silver medalists scored 84.13 with their sultry and intense crowd-pleasing short dance to “Tango: Oblivion” and “Primavera Porteno” by Astor Piazzolla. The sixth and last event of the Grand Prix series offers skaters a final chance to qualify for next month’s final in Vancouver.